Plants grow! This may not come as a complete surprise, but many of us, myself included often think that the shrub or tree that we plant will take ages to reach a satisfactory size. to a shed with timber walls. Not so! If given a modicum of care, regular watering - not necessarily a huge amount but done at around twice a week and preferably via a drip system, plants will grow noticeably bigger. Drippers deliver water at ground level, not into the air where much evaporates, so most of the water delivered by drippers will percolate down to the roots. In addition to aid the growth this year, we have had the season on our side with not so much rain over winter, but good late rains in September, which with the added warmth and daylight hours of the equinox period, meant that plants really took off. 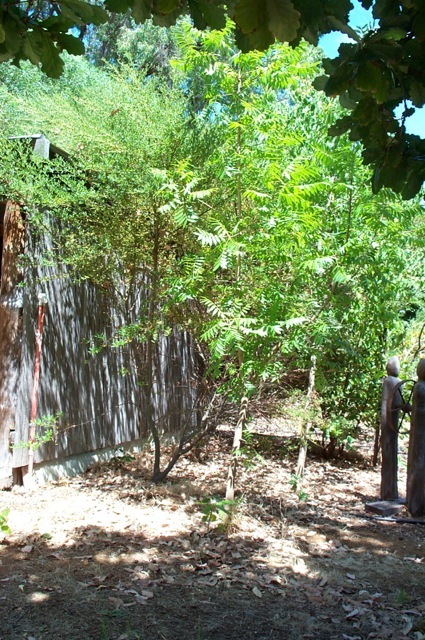 Modest little shrubs became two metre high shrubs and began to reach rooflines and come close to tree canopies. Somehow the process of raining is more effective than drippers, probably because whole areas of the garden are watered and not just the spots where the drippers reach. The Ceanothus shrubs as shown above and right are growing next to a shed with wooden sides. The Ceanothus is a short-lived Californian native that grows fast, and dies within 15 - 20 years by which time it has many twiggy, dead branches and will burn easily. It is designed to burn as a way of renewing and allowing young seedlings space and nutrients to grow. If grown near trees it can create a ladder effect whereby a grass fire or flying embers from a bushfire can set the Ceanothus on fire and in turn the flames can reach up into nearby trees where the fire can really take off. These shrubs could be pruned low, although they don't respond to pruning very well, or taken out altogether. 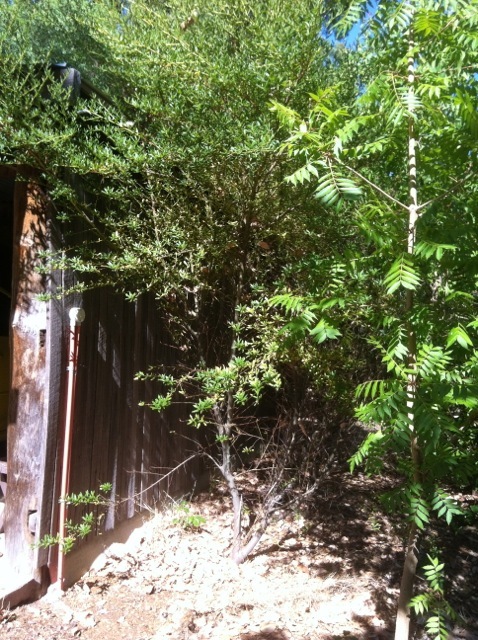 Watch this spot, these shrubs will be removed!